January 6, 2018 by Cheree' 4 Comments This post may contain affiliate links, which means if you click on a link and purchase something, I may earn a small commission (at no additional cost to you.) See my disclosure policy HERE. 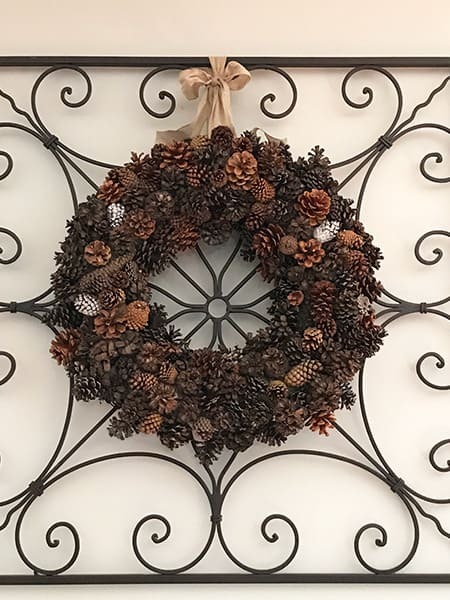 Note from Laurie: My friend Cheree made this GORGEOUS pinecone wreath, and I just love that she shared it with us! Here's what she did . . . 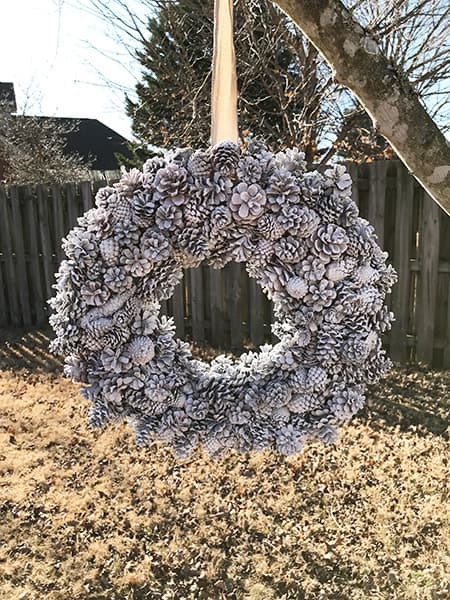 I saw a darling flocked pinecone wreath in a store recently, but it was $50!! I was sooooo tempted by it, but I just couldn't bring myself to spend that much. 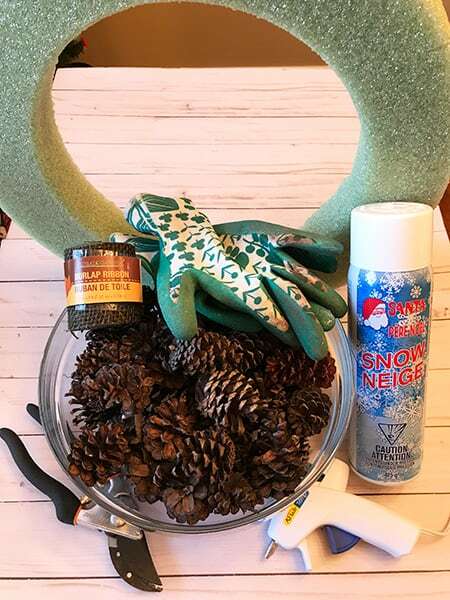 You might need garden gloves if your pinecones are particularly prickly and some small clippers in case you need to trim some of the pinecones. The first thing you will need to do is to collect your pinecones. Ask your friends and neighbors if they have any pinecone trees. I found that people will gladly let you come and clean up the pinecones out of their yard, haha! 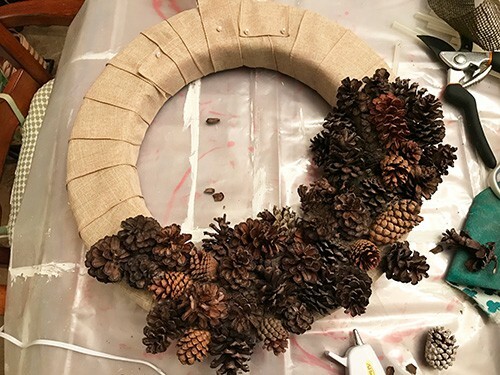 You will need the smaller pinecones for this project, so keep that in mind when you are scoping out where to get your free pinecones. Gather a ton of pinecones and once you think you have enough, gather more!!! You will need them I promise! I did end up buying 2 little bags of the smaller pinecones from Michael's that were $3 each. I happened on 2 more bags after Christmas at Target that were 90% off making them just $.50 each! Score!! Those had some larger ones in them too that I can use later. I may or may not be hoarding pinecones over here! Now, you will need a bit of patience for this part. If you find bugs in your pinecones, bake those critters right out on a foil lined cookie sheet in a 200 degree oven for about an hour. Let them cool and hang out for a day or so. Finally, start the wreath! Take your ribbon and completely wrap it around your wreath form. 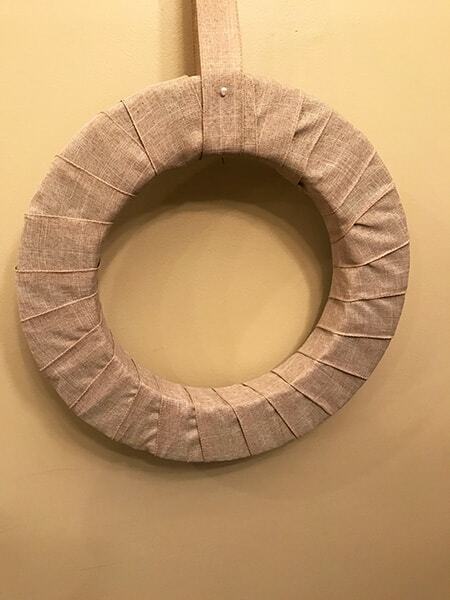 I intended to use some burlap, but got the wreath halfway wrapped and ran out, yikes! But, fortunately I had some “linen type” ribbon leftover from Christmas that worked perfectly! Just hot glue or use some long straight pins to secure the ribbon. At this point, I actually added another piece of long ribbon that the wreath will hang from. 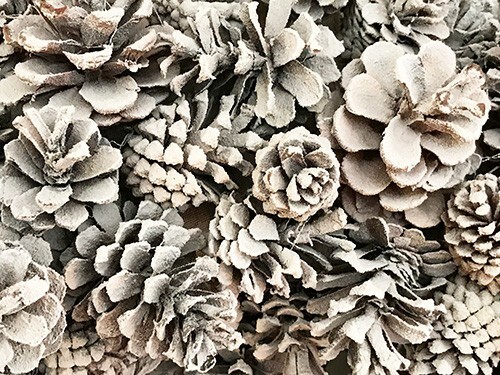 Now, the fun begins ~ fiire up the glue gun and start adding your pinecones! Once you add a few, you will see that it is really like a puzzle where as you keep adding, they fall into place. I did the front and middle section first, saving the outside for last so it was easier to manage. You will definitely have to be a bit creative near the end to complete the bottom section. I was so glad I added the tie since I ended up hanging it and sitting on the floor to finish off the bottom! I absolutely loved how it turned out in it's natural state! Honestly, I almost kept it this way and really went back and forth on whether to flock it or not! You can definitely stop here and leave it natural and it will be gorgeous! I actually hung this baby from a tree outside and lightly sprayed several coats of the flocking spray until it was covered in snowy goodness! I spent about $15 for my wreath, and I think it is just as pretty or even prettier than the one I originally saw that was $50! 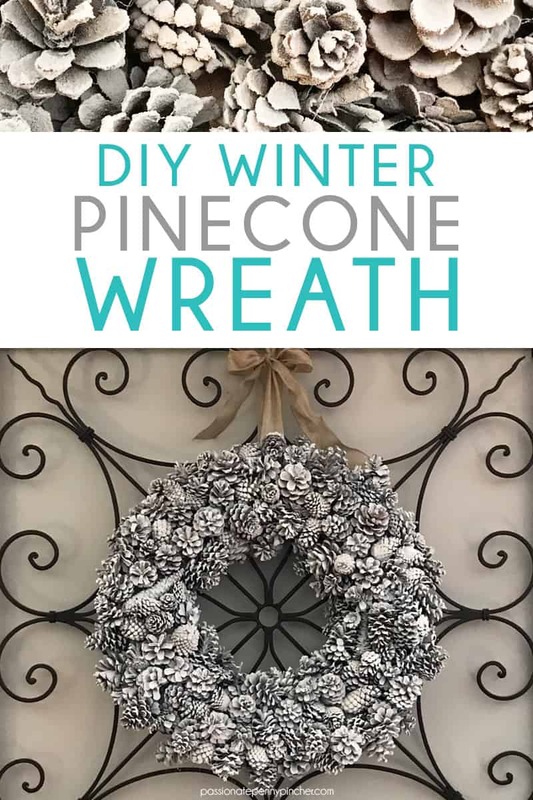 I think this DIY Winter Pinecone Wreath is a perfect addition to my winter decor, and you really can make it on a penny pinched budget. 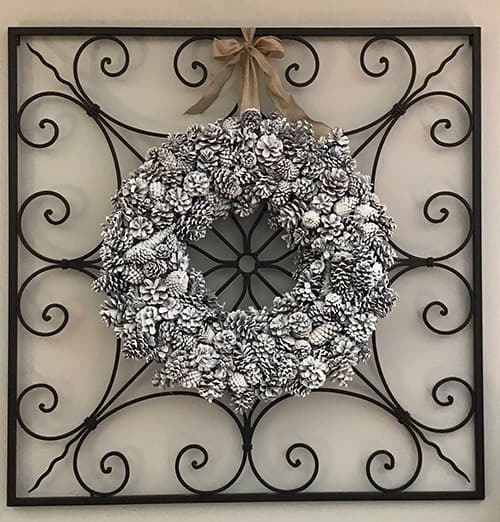 Where did you get the black frame that is behind the wreath-it is such a nice touch! Love this craft idea! Hi Jean! 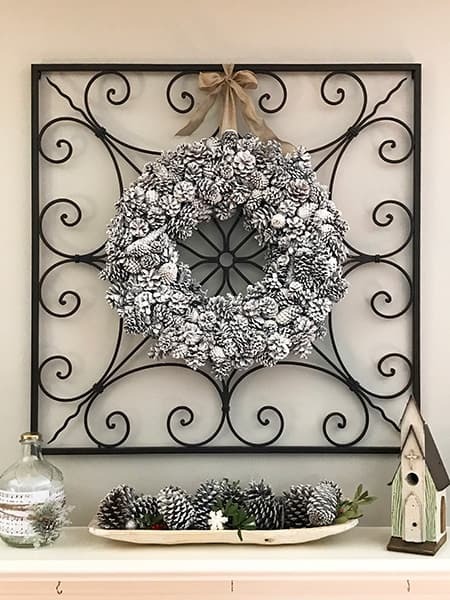 I actually got the iron piece behind the pinecone wreath at Kirkland’s years and years ago! Thanks!